Sometimes a timeline is not a timeline, according to Len de Groot, a longtime graphics journalist. A timeline shows actual spans of time, with proportional measurements for decades, years, days or hours, depending on the total time involved. “The space between events should be as important [as] or more important than the events themselves,” he says. A chronology, on the other hand, shows the momentum of a series of events. It might be more effective if presented as a list, or as an illustrated slideshow. The Wall Street Journal has published a multi-line timeline covering recent events in Arab countries (below). Selecting any day loads a region map and summary of events for that day in an area above the timeline. I like the way this compact layout shows us at a glance where activities have occurred, and when. This is a very successful timeline graphic tailored closely to the story. Is this a story about hours, days, years or decades? Does it make sense to combine the timeline with a map or a line graph? Should photos or other images be added to the timeline to help tell the story? How much text is necessary to make the story understandable — and satisfying? Most timeline graphics present time in horizontal lines, with the oldest events to the left and more recent ones progressing to the right (I suppose we would do it right-to-left if we were Arab or Chinese). 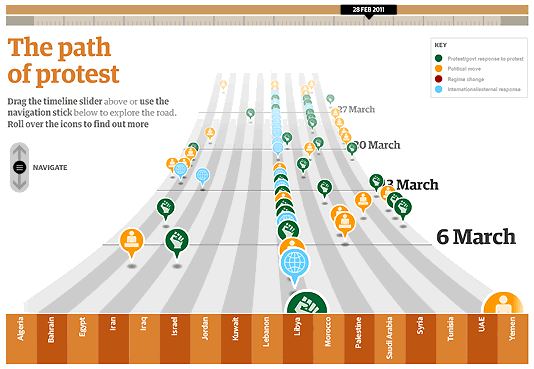 A notable and very recent exception is the Guardian’s brilliant (and vertical) Arab spring: An interactive timeline of Middle East protests (blogged about by Tracy Boyer last week). 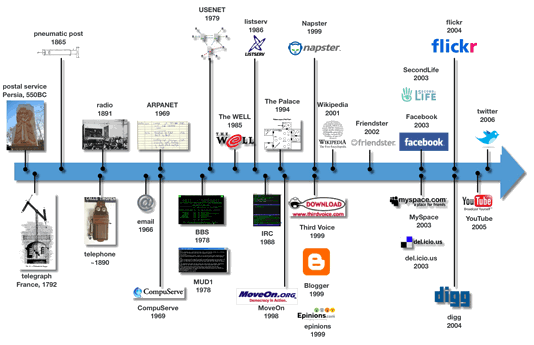 I think it’s useful to think about Len de Groot’s distinction between timelines and chronologies when admiring this graphic: Is this really a “timeline”? I don’t think so — has there ever been a better illustration of the momentum of events? No need to quibble over the words, though, when the execution is so effective. Is it helpful, easy to understand? Does it add something that text alone would not convey? 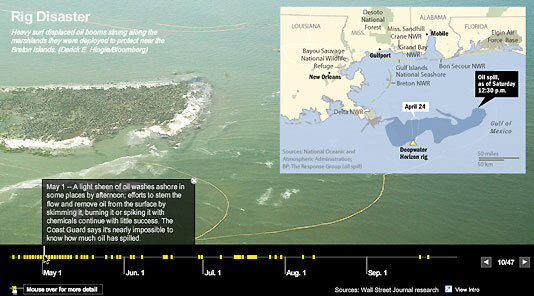 Does the graphic need to be a timeline — or would a regular slideshow (or map, or whatever) be equally effective? 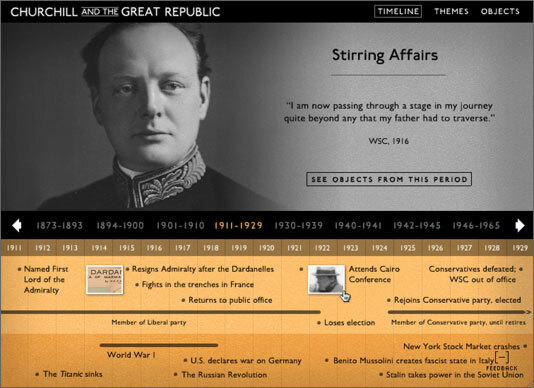 One of the more successful interactive timelines is 10 years old — every time I revisit this package about Winston Churchill, I am amazed all over again at how well it works. Note in particular the double timeline at the bottom: The upper bar is Churchill’s life, and the lower bar shows concurrent world events. Sometimes I think we fall into a “one size fits all” trap with templates or tools. You have a template or a tool, and you re-use it for various stories. But is that always the right decision? Does expediency sometimes defeat the goal of clear communication? 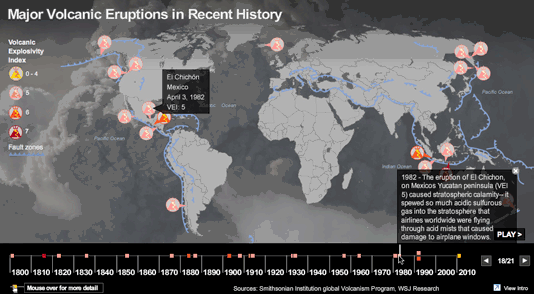 I think the Deepwater Horizon Rig Disaster timeline (above) is much more successful than the Biggest Volcanic Eruptions (below), which skimps on details about the eruptions. Both are from The Wall Street Journal. 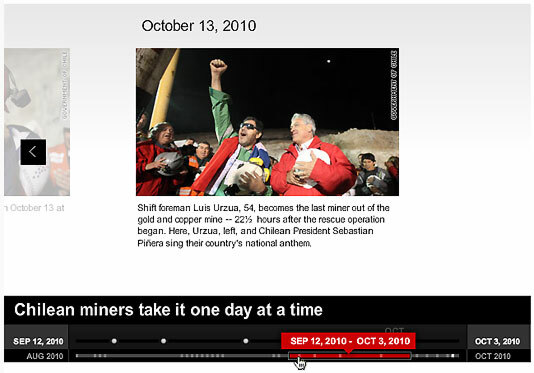 Likewise, CNN’s Trapped Chilean Miners timeline (below) is better suited to its timeline interface than the recent Egyptian Protests timeline, which uses the same interface. TimelineSetter is a new, free tool from the great folks at Pro Publica, the nonprofit investigative journalism organization. It’s not available for mass consumption just yet (“We have some more code generalization and fixes we need to do before it’s ready to open source, but we plan to do so as soon as we can,” they said on March 22), but it might be useful in lots of different situations. Below is a timeline created with this tool. 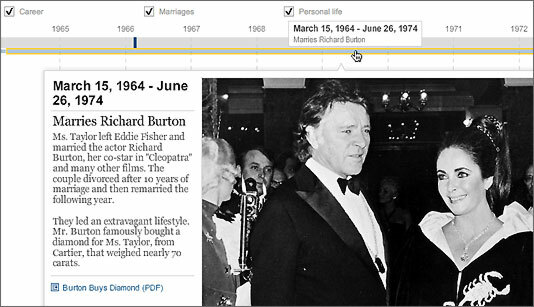 The functionality and the design are similar to the timeline template The New York Times has been using for some time; for a recent example, see Elizabeth Taylor: 1932-2011 (below). I found the checkbox options to be distracting and unnecessary. 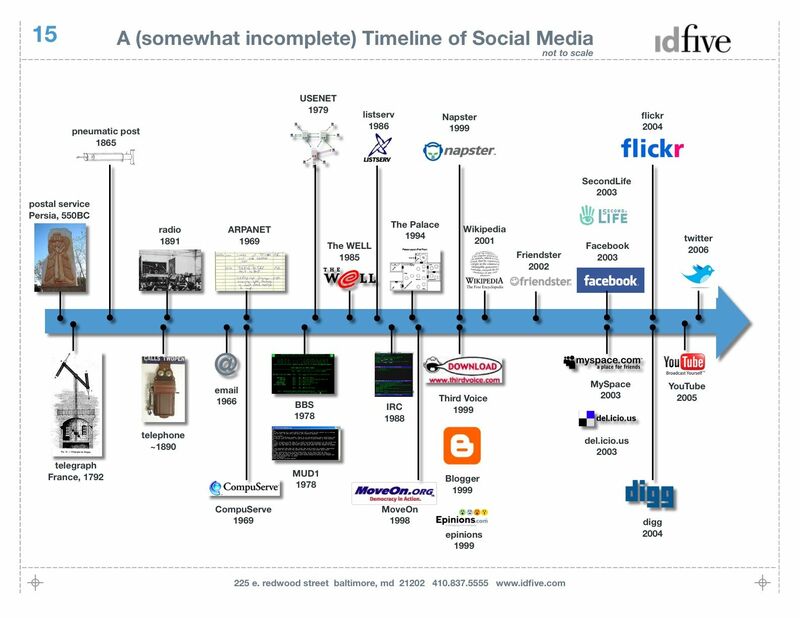 Other free timeline tools were described (and linked) in a post by Alex Gamela in May 2010. Dipity and SIMILE are fairly well known; others are less so, but it’s worthwhile to check out the different visual approaches to presenting information in this way. Which of these tools produces the best result for the story you want to tell? Do not create an interactive timeline just because it’s cool. Use interactivity to make the information more clear. Michael Jackson 1958-2009 (LA Times): Notable for the elaborate slider device. See a different visual treatment (with icons instead of photo thumbnails) using the same slider: Edward Kennedy: 1932-2009. Steadier beats mean jittery markets (Boston.com): The timeline doesn’t help me understand beat variance or market volatility, but I like the layout of the graphic. 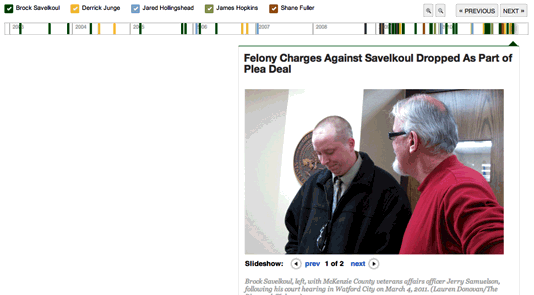 Update (Dec. 31, 2013): The new darling timeline tool is TimelineJS — free and open source! thank you so much for the link Mindy. these are great examples, and I showed a few of them in my multimedia classes. many of my students feel that timelines are an easy way to tell their stories, especially when combined with other features, like maps or video. fortunately there are many easy ways to build a timeline, but like the Guardian has shown us, there are also innovative ways to use them. Prezi is another tool that can be pressed into the service of making timelines. I built a couple of timeline templates for the presentation software and posted them on my blog. My intention was to create a resource, but to also show the potential for using prezi as a quick production tool for journalists. British History in a timeline — hat tip to @lenagroeger on Twitter. you’re right Mindy, sometimes i had a hard time making them realize that it wasn’t the best option 😛 still, in their efforts, i saw that there was an underlying logic that was replicated in different websites. for example,all the proposals for multimedia/interactive projects about the arab world crisis used timelines, and most of the stories published around the world used this same feature. but yes, that is THE question to ask everytime. Thanks for the link, Steve! And I DID include a Dipity example — History of the Wheel. It is linked above. Thanks for the link, Mindy! Great post (and I’d say that even if you didn’t link to my timeline!). Hi, Sean, and thanks for reading. I thought I had read your bio before I called you a designer. My mistake!